From left to right, war criminal, John Howard, Pauline Hanson Hunter, QLD Premier Peter Beattie, Crocodile Hunter, Steve Erwin, and framed backpacker murderer, Bradley John Murdoch. Parody: Australian Prime Minister, war criminal, John Howard has nominated Peter Beattie, Pauline Hanson Hunter, on the road to becoming Australian of the Year. Premier of Queensland Peter Beattie has nominated Steve Irwin, Crocodile Hunter, as on the road to becoming Australian of the Year. Crocodile Hunter, Steve Irwin, should have nominated, Bradley John Murdoch, the Hunted as on the road to becoming Australian of the Year. Those charges which were a set up in a preliminary sense to have Murdoch give a DNA sample in the Falconio trial and now allegedly has produced evidence in the Falconio trial. 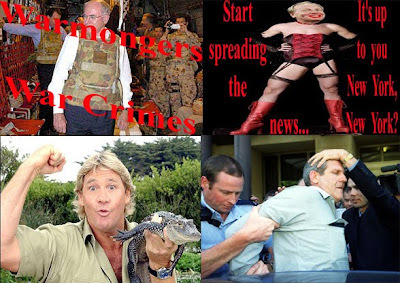 Steve Irwin should have said, Murdoch has been set up for the tourist dollar and deserves to be Australian of the year. I've got plenty and I don't need the publicity. The man who is world famous for wrestling giant crocs and saying "crikey" may hope, Murdoch will represent the Tourist Dollar in the quest to become the Australian of the Year. Murdoch is an Aussie icon, falsely imprisoned and a tourism ambassador taking the brunt for the Australian tourist dollar and the capitalists who believe that people can be sacrificed at any cost in relation to maintaining tourist confidence in Australia. Irwin should have chosen him last night to represent Australian tourism next year. Murdoch would say it would be a great honour but he'd rather be free in the war on liberty. This would be a huge honour for myself and for tourism, and you know what? Who would have thought that I could have a chance at winning something so incredibly honourable. Queensland Premier Peter Beattie would thank John Howard but there are better people out there than rich capitalists who sacrifice people's lives for politics or the tourist dollar. As Irwin would say by 'crikey' this is a good decision. Other achievers to carry the Australian flag include Pauline Hanson Political Prisoner of the year and Indigenous educator Pearl Duncan, who was named the Queenslands Senior Australian of the Year, and North Queensland medical student Alice Chang is Queensland's Young Australian of the Year. Two local hero awards went to Cherbourg State School principal Chris Sarra and Chinese community leader Eddie Liu. Should Pauline Hanson have gone to gaol in the first place? : Carmen Lawrence My answer was generic rather than specific to her case - that I could not see the benefit of jailing people for non-violent crimes; that in such cases we would all be better served if the focus was on reparation rather than retribution, rehabilitation rather than revenge."